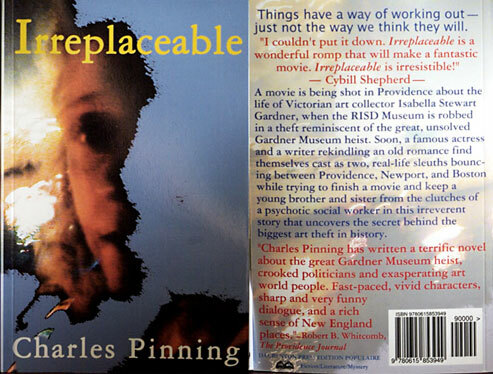 Charles Pinning is the author of the acclaimed novel, IRREPLACEABLE, which expertly weaves together art theft, orphaned children, and a long deferred romance between two, old friends. Robberies from the RISD Museum and the Isabella Stewart Gardner Museum are featured. This entry was posted in Celebrity Guides and tagged Art, art gallery, arts, celebrity guides, Charles Pinning, community, entertainment, gallery night, Gallery Night Providence, Irreplaceable, isabella stewart gardner, isabella stewart gardner museum, paintings, providence journal, Rhode Island, Rhode Island Galleries, RISD, risd museum, sculpture. Bookmark the permalink.